The power company said the wind farm will help establish the north east of Scotland as an international centre for offshore wind power generation. The first of the wind turbine foundations was installed in the seabed in March, with the final turbine put in place at the end of May. It was connected to the national grid after the laying of more than four miles of high voltage underground cable between Scottish and Southern Electricity Networks’ (SSEN) substation in Dyce and the wind farm’s onshore substation at Blackdog. 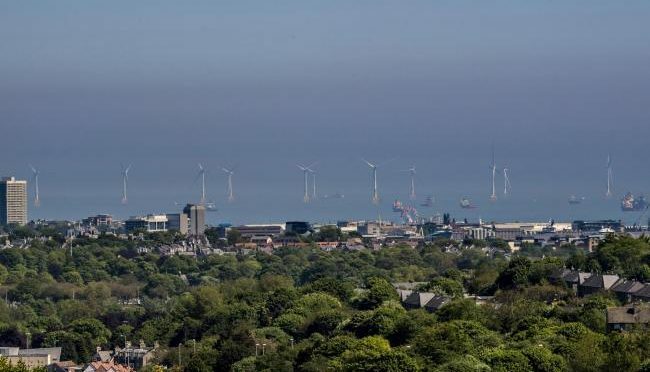 Vattenfall’s European Offshore Wind Energy Deployment Centre (EOWDC) off the coast of Aberdeen exported to the national grid for the first time in July. Its 11 turbines are said to be the most powerful in the world, generating enough energy with a single rotation to power an average home for 24 hours. An offshore wind farm that faced opposition from Donald Trump is to be officially opened by Scotland’s First Minister. Nicola Sturgeon will attend the inauguration on Friday with Scotland’s Energy Minister Paul Wheelhouse and representatives from Swedish-owned Vattenfall.